I purchased this on a whim from Sephora and surprisingly this shade is so close to Chanel Rouge Coco Lipstick in 05 Mademoiselle..just slightly more pink. Its sort of strange that I am more gravitated towards pinky nudes, even though I was always a pink/coral lip girl...always thought that nudes were sort of boring and demanded more work on eyes..
Anyways, so I swatched this on my wrist in store and was so happy to see the rich, smooth texture, however, I just ended up returning this lipstick back to store. 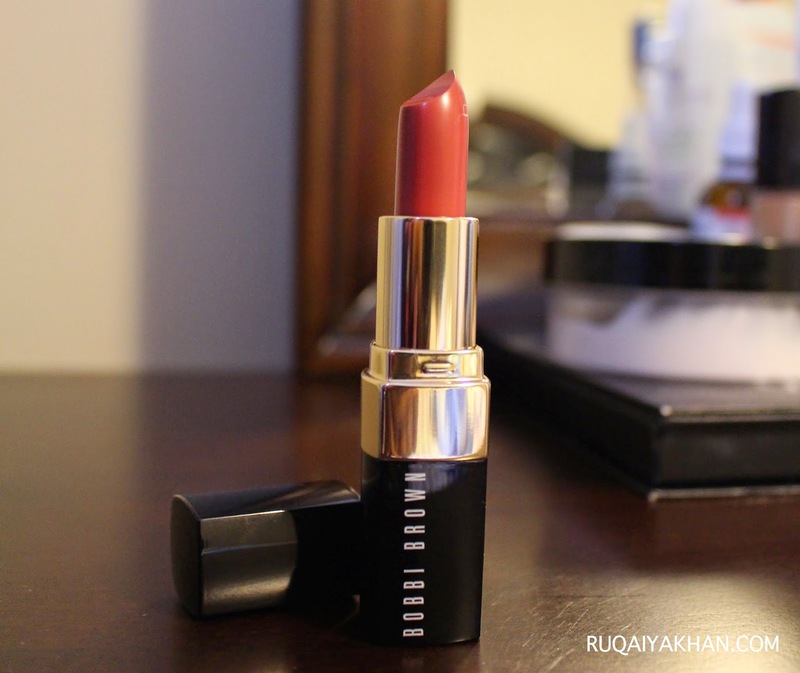 I have been a fan of Rich Color Lipsticks by Bobbi Brown (click for review) and I currently own two from that line and love them, so I somehow believed that the Bobbi Brown Lip Color, would be the same too. And I was not wrong. Its very pigmented, opaque on a single swipe, long wearing and all those nice things, you want from your lipstick...however...it stinks! It had such a strange oily, waxy smell that I could not tolerate. That's one of the reason why there is no lip swatch because I did not want to torture myself a final time for a lip swatch. The first time I wore it was when I was going to a dinner and noticed an unusual scent but then I had my Chanel Coco Mademoiselle perfume on, which masked it. I had food and then checked myself in the mirror and the lipstick had not budged. "Perfecto" I thought. Then I applied it again, the next day and the scent was soo strong, that I could not bear it and took it off - took a whiff of the lipstick and it was stinky. A gorgeous $30 lipstick from Bobbi Brown was unbearably stinky. Had to take it back to Sephora. Thanks to their awesome return policy. I was disappointed that I did not even try any other piece, not even to check, if it was only my lipstick that was stinky. Anyways, I am totally staying away from this formula. Love the "Bobbi Brown Rich Color" lipstick but not the "Bobbi Brown Lip Color" ones. Let me know if you have come across lipstick formulas that stink? How did you feel about it? Pls share. Lovely shade but sad that it was stinky.